Without meaning to, I found a new light for the hall. 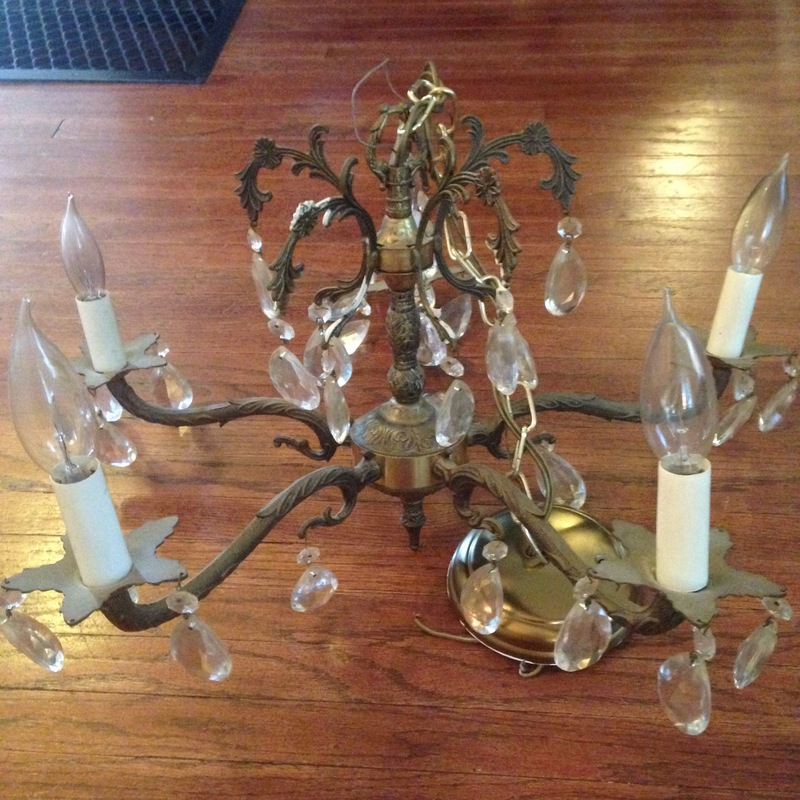 I belong to a Facebook swap group, and lo and behold, someone was selling this chandelier for $25. It turns out, it was from an apartment just two addresses down from our house! The apartments look like they were built in the 60’s or 70’s, but I’m not sure that this would be from that era. It looks older than that to me, but then, what do I know? Here’s the sticker we found on the bottom, but still weren’t able to find out a good date on this. Lance thinks it might be from the 40’s judging on the smaller size of the light bulb bases it uses. If it is truly from the 60’s or 70’s, I admit I will be sad. But not too sad because we only paid $25 for it. Truthfully, it isn’t what I am dreaming of for the space. I’d like to find something a little more of the era of our home. But for now, for that price, I really do like it. And some day if I find just what I’m looking for, I think it would look pretty sweet up in the turret of the upstairs bedroom. Holland helped me take all of the crystals off, wash them, dry them and hang them back in all of the 35 tiny holes. 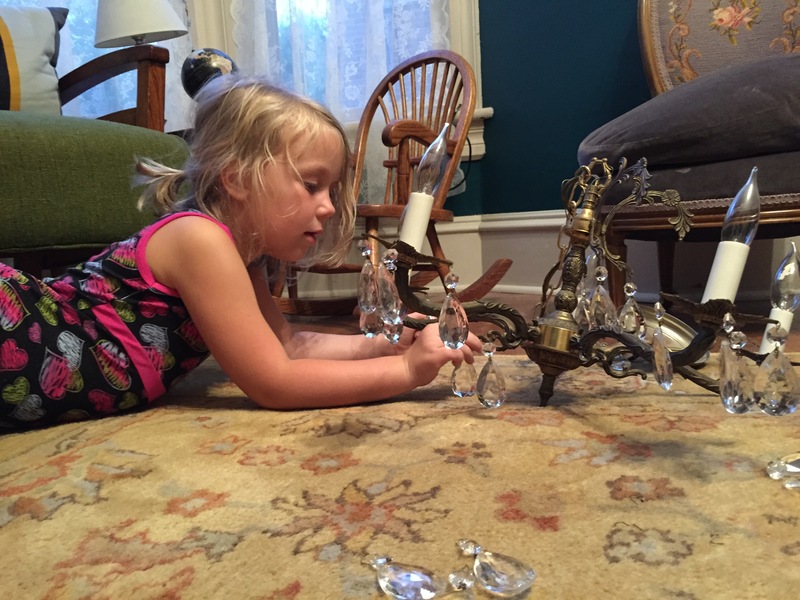 She has remarkable dexterity for a 5 year old, I must say. I realize that I have now found 7 light fixtures for this house, all within 1/2 mile from our house and all for super low prices. 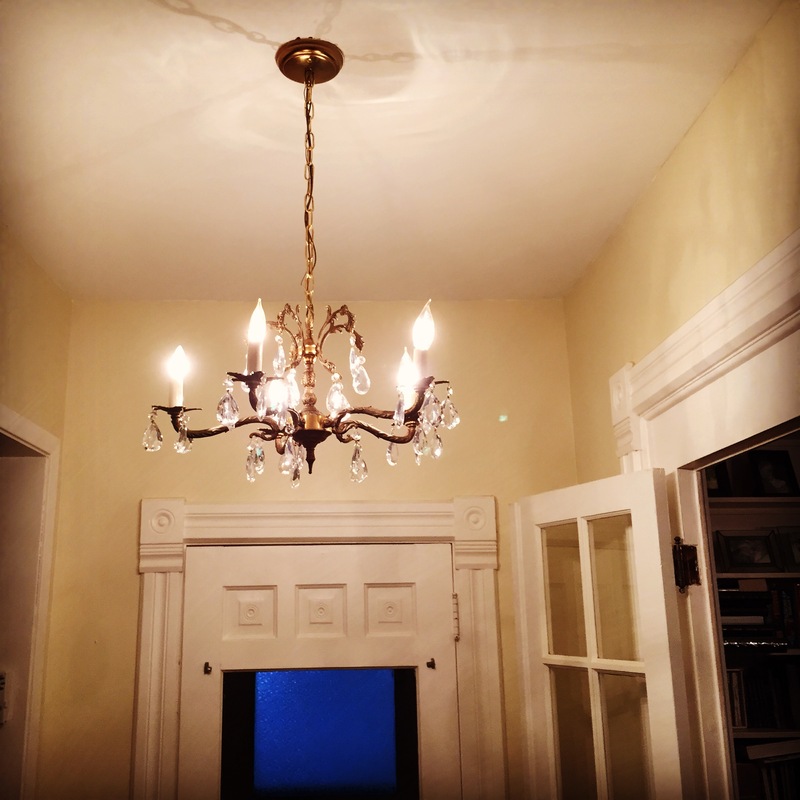 The list includes 3 chandeliers and 4 sconces. The total for all 7 lights is right around $200. Incredible. I am learning that patience is key to furnishing this home. Treasures are out there, often for amazingly little money. I would actually hate to furnish and decorate a house all at once- what is the fun in that?!?! One of the sweetest rewards of living in this house is watching our dream for it unfold, little by little, week by week. There is always something to do to make our home a little better- a little safer, a little more water-tight, a little sturdier, a little prettier, a little greener, a little homier… Today, we made it a little brighter. 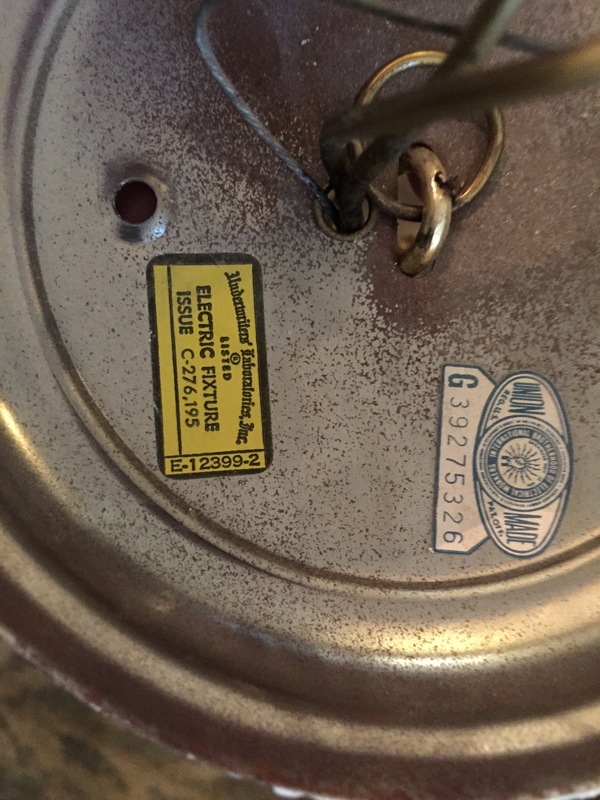 Hello, I restore vintage lighting and your lovely fixture is, indeed, 1960s/70s. If you are missing any crystals, they are readily available online. Oh, and good price!